leanings. This comes out of a really sweet commentary on Romans he wrote with David Lull which is well worth checking out. Now enjoy discovering how Whiteheadian Paul was. Thank you for this opportunity to talk about how my philosophical theology has influenced my interpretation of Romans. In my opinion, everyone is influenced in all their thinking by what they understand to be real. But since relatively few, these days, even relatively few philosophers, discuss metaphysics, or recognize this level of reflection, the influence is largely unconscious and therefore uncriticized. I owe to Whitehead and Hartshorne the fact that I think a good deal about this question. I need very briefly to explain the difference between the way I understand reality and the way that most people today, especially as heirs of the Enlightenment, assume it to be. Most people think that their access to a world other than their own experience is through their sense organs. They focus especially on what they see and what they feel through touch. For practical purposes this gives them a world of solid objects that are colored. If they have studied some epistemology, they may agree that in fact what is given is only a phenomenal world. In either case, whether sensa or material objects, the entities making up the world are mutually external. It is widely assumed that no two things can occupy the same space at the same time. These assumptions underlie the political and economic thought of the Enlightenment as well as its natural science. They have made any real concept of “community” difficult. They have made a coherent interpretation of quantum physics impossible. I have been persuaded that another understanding of reality is better. This begins with an analysis of a moment of human experience itself. This is an event, rather than a sense datum or an empirical object. Instead of trying to understand this event as a product of objects in motion, this approach proposes the hypothesis that the world as a whole is composed of events and that in their most basic structure they resemble human experiences. The analysis of the basic structure of a moment of human experience is in terms of its relationships to other events. Most of the content of one moment of experience comes from the influence, the flowing in, of past experiences. Much of the remainder comes from new stimuli derived from the body, especially through the brain. These mediate the influence of events outside the body, especially through the sense organs. There may also be some influences from outside the body, especially other human experiences, whose effects in experience are more direct and immediate. And in the theistic vision of Whitehead, there are also novel possibilities for the self-constitution of the new experience that express the inflowing of God into the occasion of experience. The references to the body and its sense organs can be generalized only to other vertebrate animals. But the general point, that the presently occurring event is constituted by the inflowing of other events can be generalized much further. Hence, in this view, the real things that make up the world are not mutually external individual objects; instead, they are events constituted by the new unification of other events. In Whitehead’s terms, events are not “simply located.” Each event includes other events. A human experience is largely constituted by its relations to others. It is social through and through. The same is true of a quantum of energy. What does this have to do with the interpretation of Paul? Quite a lot, I think. Of course, I am not claiming that Paul held to just the same view of reality to which David and I hold. But I do believe that when Paul has been read through the eyes of the dominant understanding, much of the richness of his thought has been obscured. I believe that when one is open to believing that entities interpenetrate one another, much that he says can be affirmed more seriously, and, indeed, more straightforwardly. Speaking of those in the communities of believers, Paul said that we are members one of another, that together we constitute one body, and that this is the body of Christ. As long as we think of ourselves as bounded individuals, fundamentally external to one another, connected through contracts or common interests, this language can not be taken very seriously. On the other hand, if we understand that we are fundamentally constituted by our relations with one another and with a past that includes the Christ event, the language makes much more sense. I have been embarrassed throughout my career by my extreme limitation with respect to languages, and especially the biblical languages. 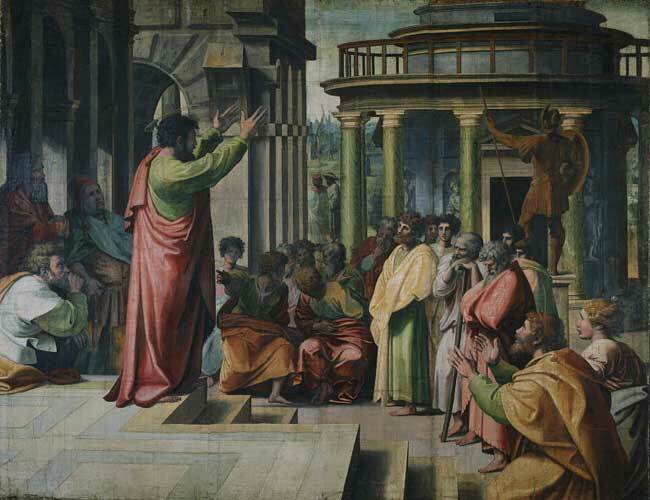 Prior to this opportunity to work closely with a New Testament scholar in the interpretation of a text, I have been quite hesitant to make pronouncements about the meaning of scripture. However, given my biases, in my Christology, I did dare to pick up on Schweitzer’s idea that Paul thought of a spiritual field of force emanating from the Christ event. I dropped the word “spiritual,” since in my understanding such a field of force emanates from every event and is at once both physical and spiritual. It consists in all those events that in some measure internalize the one in question. Every historical event affects all the events in its future. Given this metaphysical view, it is easy to assert that some events, such as the Christ event, have had a far greater field of force than most others, that the church serves continuously to renew, re-form, and channel this field of force, that the decision to orient oneself in terms of that field of force rather than others increases its efficacy in one’s life, and that much of Paul’s language about our relation to Christ makes sense when we think in these terms. The Whiteheadian metaphysics also makes sense of Paul’s language about our relation to God. The idea of God’s Spirit indwelling us and of God’s love being poured into our hearts has been puzzling to those who accept the dominant worldview. For a Whiteheadian, it is quite straightforward. God is literally in us in the strong sense of participating in constituting what we are moment by moment. The effectiveness of that presence depends greatly on our decisions and many other factors. Most important for our interpretation of Romans is the relation between ourselves and the Christ event. If that event is fundamentally external to us, then its saving effect must be that, in some way, it changed God’s attitude toward us. Theologians have held various views about how Jesus’ death satisfied God’s requirement of righteousness from human beings so that God declared believers to be just. For nearly a thousand years many Christians have supposed that some such doctrine is the heart of the gospel and that it expresses Paul’s message. If we approach Romans with the view that all things participate in other things, we can find there a quite different understanding of how Jesus brought into being a new relationship between humanity and God. The crucial relationship of others to Jesus is one of participation. This is strongly suggested in Romans 6. The NRSV tells us that we have been baptized into Christ Jesus and that this is a baptism into his death. We have been buried with him by baptism so that just as Christ was raised from the dead, so we too might walk in newness of life. If we have been united with him in a death like his, we will certainly be united with him in a resurrection life his. In 8:17 Paul tells us that we are joint heirs with Christ—if we suffer with him so that we may also be glorified with him. Despite all this language, at least in Protestant circles, the focus has been on pistis. This was certainly important to Paul, but we believe that it should be understood in a way that ties it much more closely to the rhetoric I have summarized of union with Christ Jesus. We propose that Paul taught that just as we participate in Jesus’ suffering, death, burial and resurrection, so also we participate in his pistis. But the dominant translations are based on different assumptions and do not allow this idea to come to expression. The role of a philosophical theology is not to dictate translations. It does, of course, bias one toward one translation or another. Theological bias influenced by philosophy has prevented translators from writing about the pistis of Jesus. Only very recently have they acknowledged that a number of texts can be read better as speaking of this. We think that the pistis of Jesus was as important to Paul as the suffering, death, burial, and resurrection of Jesus. Indeed, these expressed or resulted from his pistis. Further, pistis has almost always been translated as “faith” even though in some instances, such as references to the pistis of God, translators have recognized that they must translate it as “faithfulness.” We recognize that both translations are valid, but we believe that “faithfulness” is the more inclusive term and that Paul often had this more inclusive meaning in mind. We chose to reverse the balance, using “faithfulness” wherever it fits and “faith” only where it is clear that Paul focused on the narrower meaning. In particular, we believe that Paul was impressed by the faithfulness of Jesus, for example, in going to the cross for the sake of sinners, and that speaking of the faith of Jesus does not capture the fullness of Paul’s meaning. To show that this is a plausible interpretation of Paul’s theology led us to a concentrated focus on Romans 3:21-30. For the detailed exegesis of this passage I have been wholly dependent on David Lull. But I am persuaded that his retranslation of this passage is more accurate to the Greek and makes far more sense than what we find in the NRSV. It also fits much better with the theology we find elsewhere in Romans. We have, of course, relied heavily on other New Testament scholars, scholars who are unlikely to be influenced by the metaphysics that is important to David and me. This is important. Philosophical theologians must be especially careful to avoid any crude eisegesis, and the concurrence of scholars without their prejudices as to the meaning of texts is especially important. One final word. I believe that the point of view of interpreters deeply affects what they see and describe. I have accented the role of our point of view in my comments. I also believe that it is crucial that what we see and describe from that point of view can be seen also by those who are not particularly interested in the point of view. I hope that even those who are committed to more conventional metaphysical ideas will agree that Paul may have thought in a way more like what we describe. Of course, I would be even happier if some decided that this point of view is fruitful and adopted it, at least provisionally.